« The 12 releases September 6th! When I was getting close to releasing The 13, one of my readers asked what inspired that story. I’ve gotten a lot of comments about the names of the ships – the Nimoy is a favorite – and where the idea came from. The answer is a lot of places. When I went to college, I thought I was going to be a doctor. I took all the classes: the five credit hour chemistry that met every day of the week including a three-hour lab slot, the biology course in the giant lecture hall where I personally believe they were doing something meta and trying to make you feel like an insignificant individual cell in a giant living organism, the calculus courses – because we all know that there’s a lot of calculus involved in determining an illness ;). I did all of it for a year before I had to stop and take stock of what I really wanted. I’ve never been good at memorizing things. Something in my brain revolts at the very idea of it. I love math and I excelled at the physics and calculus classes. But, as soon as I attended my first Organic Chemistry lecture sophomore year and they put a gigantic carbon chain up on the screen for the students to look at, my brain nearly rioted. I knew then and there I wasn’t cut out for that stuff. I dropped my science courses and enrolled in a bunch of 100 level intro courses to find my passion. I tried psych 101 – the first lecture was about how one of the four professors who taught the course could sit with us for 15 minutes and know more about us than we knew about ourselves. I know it was supposed to impress, but I just found myself annoyed. I stuck with the course, and there were some really interesting things taught, but it didn’t enthuse me. I took econ 101, because I did like math and figuring out problems, but it was a little dry for my tastes. And I took PoliSci 101. Breathe deep. 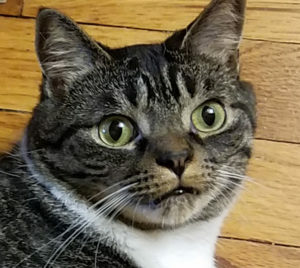 Look at this cat. I will not be talking about politics here. Oh no. Politics. Not here. Not now. Nonononono! Don’t worry. That’s not what I’m going to talk about. In those days, what really and truly drew me into Political Science was the comparative politics branch. Where I went to college, you chose two political science disciplines to focus on from four: American Politics, Political Philosophy, Comparative Politics, and Statistical Models. You took a little of all of those, but you took more on your chosen two fields. I chose American Politics – because I was 19 and an American so it seemed like it was one of those “in my wheelhouse” things. 😉 – and Comparative Politics because I simply found it fascinating. Learning about all the different types of governments that existed through history and into modern times felt like delving into the back stories of all my favorite science fiction dystopias. So much of what I’d read growing up was laid out in the textbooks for those classes. Later on, I’d add an English major to my repertoire to round out my burgeoning desire to write, but this is about where The 13 came from, so we’ll fast-forward a bit. After I graduated, I ended up getting a Masters in Library Science. I’ll admit, I was disappointed I couldn’t do much with a Poli-Sci/English degree. I could have gone the lawyer route – that’s where a lot of PoliSci students go – but that wasn’t something that interested me. I loved libraries though, and thought I could specialize as a PoliSci librarian at a big university. I was still young, and my ideas were fluid. I ended up at a public library as a Teen Librarian – in no small part because I’m drawn to YA literature and working with my teens was a blast. But I still had a yearning to do something with all the stories I’d stored up in my brain. Eventually I got the opportunity to start putting my stories out there. Fast-forward a little more and I had published several titles but no science fiction. I really, really wanted to get into space. I love writing fantasy, too, but science fiction calls to me like nothing else. I’m always sneaking a little of it into my fantasy writing, whether it’s an insect that creates an elaborate home full of decorations which I’ve used the bowerbird as a base for, or when I describe magic as the agitation of molecules, I’m blending my love and knowledge of science with the magical and fantastic. With science fiction, I can dive headfirst into the world of possibilities that science represents. Who could watch a bowerbird do its thing and not imagine stories about it? In The 13, I’ve also blended my love of political systems with biology. I didn’t hate everything in my biology courses. It wasn’t all memorizing body parts and taxonomies. There were a lot of other aspects of biology I was truly interested in. I don’t want to make it seem dull. Just, you know, a good chunk of it is dull. 😀 Unfortunately you’re forced to learn the dull chunks with the exciting bits. Like a lot of intro courses, the first year of biology is split up into different specializations. For about six weeks, we had a professor whose specialty was evolution. There’s a particular lesson that stands out to me from those lessons that applies to The 13. In Mexico there is an area that is called Cuatrociénegas. This link will take you to a pretty technical description of what Cuatrociénegas is, but imagine the Galapagos Islands, only with marine animals. The Cuatrociénegas is an oasis that has these isolated pools of water and life. 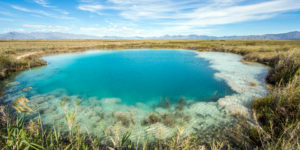 The life in the pools has common ancestry, as the water in the oasis was once sufficient for the pools to join, but each pool has its own distinct ecosystem. 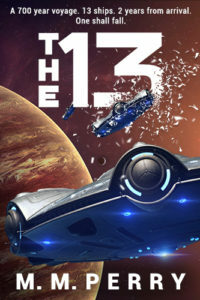 This is the model for The 13. All of these people came from the same source – Earth. But over the years they have become isolated from each other, developing their own cultures, slang, rules, governments and goals for the future. Even their ideas about their history has adapted over the years to fit their worldview. Some believe they were sent by a benevolent people who simply wanted to give humanity a chance to live outside the solar system we know. Some believe those ancestors had more selfish ideas about the planet they will soon land on, and were only using the colonists as tools to get there. As they grow close to the end of their journey, they begin to clash because they each have their own idea about how things should be once they get to Mission’s End – the culmination of their nearly 700 year long journey. Writing these books has allowed me to explore, in micro-cultures, how certain types of governing would play out under certain conditions. What if you had a person who had complete control over their citizenry and who believed emotion was the root of all that ails society? What if you had soldiers take control of society because they believed the people who sent them were corrupt? What if you had a society that worshiped the ones who sent them, and allowed themselves to be ruled as if by an all-knowing god? Would a representative democracy survive these conditions better, or a dictatorship? What if the dictatorship was led by someone who had good intentions, but the democracy was led by someone who had bad intentions? These are all ideas I will play with in the books. The societies on the ships are not meant to be ideal, merely an exploration of one type of governing choice under a very specific set of circumstances – being isolated from their original society in the far flung reaches of space, forced, in some cases, to survive with very little.